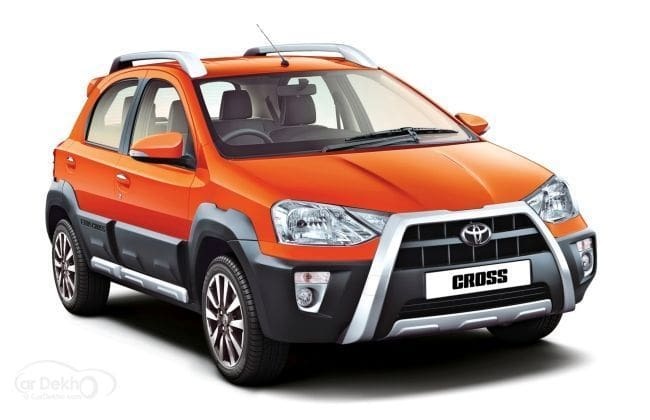 Toyota has launched the new Etios Cross today in India with prices starting from Rs 5.76 lakhs ex-showroom Delhi. Unveiled at the 12th Auto Expo in February, the Etios Cross will be the third member of the Etios family after Etios and Liva. The new Etios Cross will be available in three engine options - two petrol (1.5-litre and 1.2-litre) and one diesel (1.4-litre) and combines the rugged looks of an SUV with the easy drive, fuel efficiency and maneuverability of a hatchback. On the outside, the Toyota Etios Cross comes with a bold front grille, side cladding, diamond cut alloy wheels, roof rails, rear cladding, roof spoiler, fog lamps with integrated turn indicators, ORVMs with turn indicators and rear defogger with wiper. Inside, the Etios Cross gets piano black interiors, sporty seat fabrics with white stitch and logo, 2 Din audio system with Bluetooth, USB and Aux-in support, leather wrapped steering with audio controls and driver seat height adjust. Safety features include dual front SRS airbags and ABS with EBD. The Toyota Etios Cross will be offered in four grades, two for petrol and two for diesel. The G grade will be made available with the 1.2-litre petrol engine that pumps out 79 hp of power at 5600 rpm and 104 Nm of torque at 3100 rpm. The V grade will be available with the 1.5-litre petrol engine making a maximum power of 89 hp at 5600 rpm and a maximum torque of 132 Nm at 3000 rpm. The GD and VD grades will be powered by the 1.4-litre diesel engine making 67 hp of power at 3800 rpm and 170 Nm of torque at 1800-2400 rpm. All the engines are mated to a 5-speed manual transmission. Fuel economy of the three engines - 1.2-litre petrol, 1.5-litre petrol and 1.4-litre diesel - are tagged at 17.71 kmpl, 16.78 kmpl and 23.59 kmpl respectively. Speaking on the occasion of the launch, Mr. Naomi Ishii, Managing Director, said, “The B car segment is one of the fastest growing segments in the industry. Segment growth comes along with fast changing customer requirements. Customers today want a vehicle with unique styling that will make a statement. The Etios Cross has been introduced to cater to these needs. We look forward to delighting our customers with the Etios Cross that comes with the globally renowned promise ofToyota’s QDR (Quality, Durability & Reliability) standards. The new Etios Cross is available in eight colours - the new sporty Inferno Orange, Ultramarine Blue, Classic Grey, Symphony Silver, Celestial Black, White, Vermilion Red and Harmony Beige. Having been already launched in Brazil, the Etios Cross has become a hot seller there and Toyota will be hoping to repeat the same trend here. The new Etios Cross will also be exported from India.